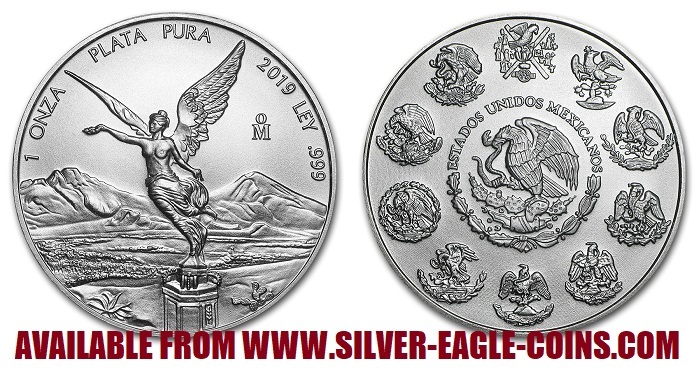 These gorgeous silver coins are very popular due to their elegant design which features the "Independence Angel" which is a well known historic monument in Mexico City. The reverse of the coin features the current Mexican National Coat of Arms with an eagle atop a cactus, clutching a serpent, surrounded by historical Mexican National Coats of Arms. Each coin is 40 mm in diameter and contains "1 onza plata pura ley .999" which translates to "one ounce pure silver 0.999 fine".